The sun-drenched valley city of Oaxaca, in the Mexican state of the same name, is considered by many to be the country's culinary capital. Apart from being the land of seven moles (pronounced moh-leh), Oaxaca also boasts an impressive gastronomic repertoire long admired by the rest of Mexico and gastronomes the world over. 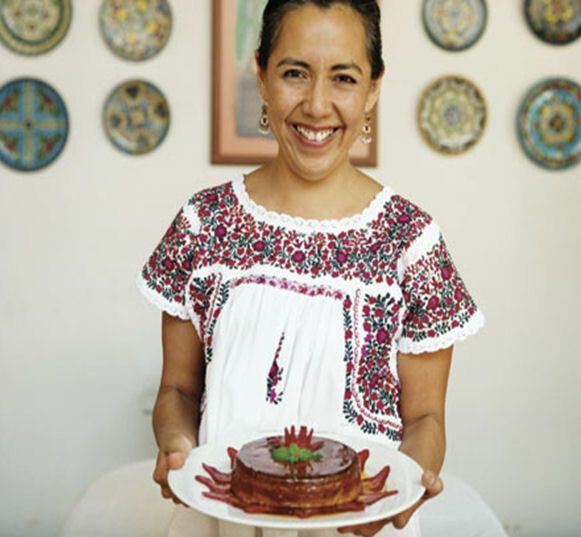 Working within the state's rich and proud culinary heritage is one of Oaxaca City's brightest lights in the food world, Pilar Cabrera Arroyo (in photo holding one of her luscious flans). This September, 2009, Pilar will be visiting Toronto, ON to share those well-preserved traditions with food enthusiasts throughout the GTA. Pilar grew up in Oaxaca City surrounded by the state's vast food history and ingredients- including chile dusted fried grasshoppers (chapulines) and pre-Hispanic dishes that tell the tales of ancient, native peoples. After completing a food engineering and nutrition degree, she worked in research and development for the food giant Herdez-McMormick before returning to her true passion- cooking. In 1994, she opened her own restaurant, the award-winning "La Olla" (or the Pot), featuring the produce of regional (when possible, organic) farmers who help make her Oaxacan cuisine a living work of art. Pilar has also found a growing fan-base of intrigued foodies around the globe through her "Casa de los Sabores" (House of Flavours) cooking school where banana leaf wrapped tamales, rose petal sorbet and Oaxacan yellow mole have become oft-requested recipes. 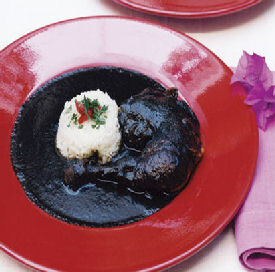 Oaxacan cuisine is a labour of love that requires attention, a deft hand, fine-tuned taste buds and old-world knowledge. Pilar learned the basics and the cuisine's subtleties from her mother and grandmother. She's an excellent teacher and speaks English fluently. For Pilar, sharing the food of Oaxaca with Torontonians is akin to giving them a glimpse into the region and the dishes that satisfy both body and soul. And for the first time in the chef's illustrious career, she'll finally have the opportunity to do just that this September. For a report of Pilar's visit to Toronto, see Oaxacan Chef Sets City of Toronto Ablaze.